Why Is Granite Such A Popular Material? Using granite throughout your home is easier than you think! 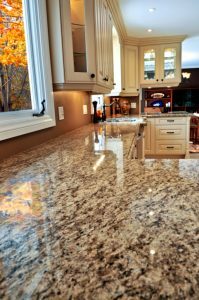 Granite has been and continues to be the choice for countertops for many homeowners looking for an upgrade to their current situation. In fact, granite is one of the top-rated and most sought after materials for many looking to remodel their homes. From being extremely durable to its rich history, granite continues to be a popular material and for good reason! Granite can be used in a variety of ways to enhance the look and functionality of any home. In fact, since granite is heat resistant and scratch resistant, many homeowners choose granite as their countertop material in kitchens. However, the possibilities for artistic expression with granite are seemingly endless as well. Custom fabricators can use any leftover granite material from a recent kitchen or bathroom remodel and create something that is unique to your home. Some extra uses for granite include adding to a fire pit or patio furniture. In fact, customer fabricators can create various odds and end like candle holders and bookends out of granite that gives a unique touch to the overall look and feel of any home. In addition, granite can be a great material for coffee and end tables that would complement the rest of the home. Homeowners who choose to use every last inch of their granite reap magnificent rewards in the long run. Bottom Line: Why Choose Granite? In the end, granite is simply a wonderful material that can withstand the test of time. With its exquisite durability and unique color options, granite is a material that simply can’t be beaten. Therefore, the next time you are considering a material for your home, choose granite. It’ll be the best decision you ever make! This entry was posted on Friday, May 19th, 2017 at 11:22 am. Both comments and pings are currently closed.